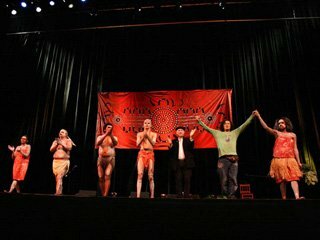 In Sept 2004 Descendance was to claim their ultimate prize on the International arena when they represented Australia at the first cultural style Olympics in Seoul Korea, the event was billed as “The World Culture Open”, from seventy countries who entered the competition, Descendance took out the Major World Dance/Peace Prize, the event was organized by UNESCO. Descendance Aboriginal and TSI Dance Theatre have been fortunate to have taken its culture to over 40 countries around the world and even after such extensive travelling have never taken the privilege of representing indigenous Australia for granted, the Vietnam tour Apr 2012 will go down as one of the most memorable and captivating tours ever completed by Descendance, Vietnam has somehow been able to maintain the charm of old Asia in a world rapidly falling into western customs, the hospitality and warmth of its people was second to none. Vietnam conjures images of suffering and death the legacy of its war torn past, these obstacles have only made its people more resilient and united; the country has had to fend off interventions from the Japanese, French, Russian, British and Americans to finally stand alone as an evolving independent and colorful entity with a charming community feel right across the country. Descendance were overwhelmed by the love showered upon them by Vietnamese audiences, The Hue Festival in central Vietnam being the major assignment on this tour, The Hue Festival proved to be one of the most spectacular festivals in the world both in grandeur and detail with countless satellite events around this bustling and somewhat chaotic city, the spectacular opening ceremony resembled an event fit for the Olympic games, the street parade for the participating countries was met with unprecedented enthusiasm by the locals , Descendance also staged 2 major one hour concerts for the festival to capacity audiences, after Hue Descendance moved to the beautiful scenic City of Danang with its white sandy beaches and rolling mountains, here in unison with The University of Queensland staged a concert and seminar educating Vietnamese students about indigenous Australia, the last leg of the tour was in South Vietnam in the country’s biggest city Ho Chi Minh with a population of 10 Million, and this was to prove the pinnacle of the tour with Descendance staging a stunning 90 minute concert which included Aboriginal, Islander, Acoustic Sets and a thrilling Contemporary dance piece with a local dance company, Descendance arrival in Ho Chi Minh was listed in tourist magazines as the second major event in the city, the concert exceeded all expectations and was met with a rousing standing ovation. Hawaii has become a second home for Descendance after an astonishing eight year run at the Honolulu Festival from 2005-2012 on the Island of Oahu; it has also enjoyed the benefits of the beautiful neighboring islands of Oahu performing on six of the seven Hawaiian Islands. The 18th Honolulu Festival 2012 did not disappoint, it delivered an even bigger impact and wider success than the 2011 Festival which was marred by the tragic Tsunami which hit Japan, the streets of Waikiki were jammed packed for miles as tens of thousands of spectators witnessed the spectacular procession of cultural floats from the Pacific islands in the grand parade which is the finale and highlight of the Festival. Descendance have been a crowd favorite in Honolulu since its inaugural invitation in 2005, they performed live for over one hour on a moving float on the streets of Waikiki to a wild reception, other activities included performances at The Honolulu Convention Centre, an outdoor concert on the Beach walk stage and workshops for many of the local school children, Descendance was proud to receive an award from the festival for their outstanding contribution over the years. The Festival concluded with a spectacular fireworks display on Waikiki Beach which was dedicated to the Tsunami victims of Japan, Descendance would like to thank its wonderful sponsors and partners Hawaiian Airlines, The Honolulu Festival and Ohana Hotels for its continued support and belief in Descendance. 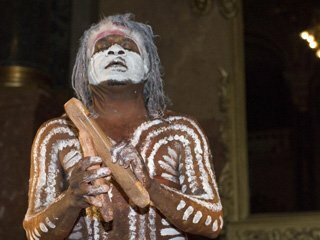 Descendance Aboriginal & TSI Dance Company completed its third visit to Russia in April-May 2011; the tour was realized through its partnership with McGor Productions and The Vegas Centre in Moscow. 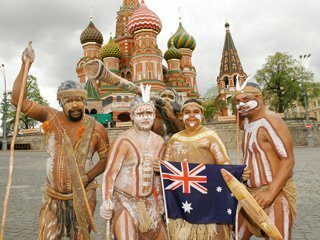 The Vegas Centre in Moscow celebrated all things Australian for the two-week season, highlighted by daily performances from Australia’s most toured International cultural show Descendance. The tour gained broad coverage with Descendance reaching vast audiences throughout Russia thanks to a slick advertising and PR Campaign which included vast indoor and outdoor advertising, Radio, TV, and print media, a performance at The Australian Embassy in Moscow for Russian children with disabilities proved to be a very emotional experience and one of the tour highlights. Russian audiences were friendly and hospitable and warmed to the powerful high-energy shows, beautiful friendships were formed, lasting memories were etched, and our love for Russia deepened. The culture of Moscow was in vast contrast to our recent trips to Hawaii and Qatar, as Russia has a unique charm like no other, although it was spring time in Moscow the weather was cold and bitter on arrival, but not long after the beautiful Moscow sunshine greeted us and stayed until our last day, now we understand why Vodka is an important part of its culture, with the world’s worst traffic jams and its vast array of beautiful women it’s enough to lead any man to drink. Descendance has toured Hawaii for 7 successive years, but the 2011 tour will long be remembered for the Tsunami which was due to hit the islands on Friday March 11th at 3am, this being an aftermath of the tragic Earthquakes in Japan. Honolulu was in a state of frenzy as sirens and public announcements roared throughout the city with warnings of the coming Tsunami, Descendance performers kept their composure throughout the ordeal knowing that the situation was now in the hands of destiny, as it turned out the wave lost momentum on its journey across the Pacific and was repressed before it reached the shores of Waikiki, however some of the other Hawaiian islands did not escape the waves wrath but only suffered minimal damage. Descendance was the featured artists at the 17th Honolulu Festival, Hawaii’s premier cultural event, which culminated in a grand parade of pacific countries performing across the city and down to Waikiki beach. 2011 saw an audience of over 200,000 people turn out on a perfect spring day, the festival was again a great success a tribute to the tragedies’ in Japan, Descendance performances were once again powered with energy and passion as their popularity in Hawaii reached new heights, Descendance would like to thank their wonderful partners in Hawaii who have been behind their exceptional popularity, Hawaiian Airlines, Outrigger Hotels and The Honolulu Festival. 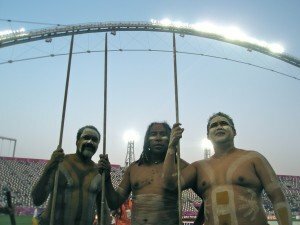 Descendance Aboriginal Dance Company were invited to perform at various high profile events during the staging of the Asian Football Confederation Cup in Doha Qatar, highlighted by a live show during the Final between Australia and Japan, which Australia lost 1-0 after an epic 2 hour struggle, the event was broadcast to hundreds of millions of people around the world and witnessed by a sell-out stadium, the tournament was well organized and concluded with a breathtaking fireworks display in a stunning closing ceremony, Qatar showed the world its more than worthy to host to stage the 2022 Fifa World Cup. 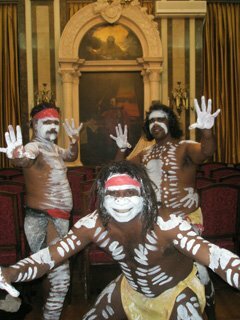 Descendance performances were received with great passion as Arabian audiences embraced the indigenous Australian culture, many seeing it for the first time, it was refreshing to be in a city with no alcohol culture, this ensured Soccer attendees were well behaved. Descendance s senior didgeridoo player Goomblar Wylo performed in Seoul Korea For Macquarie’s 10th anniversary event in June 2010, the event was held in the prestigious Emerald room at the Shilla Hotel; Goomblar performed a solo didgeridoo show and a fusion with Korean band “Oriental Express”, the event was produced by leading Asian Event Company Jack Morton’s. Descendance Aboriginal Dance Company featured in two of Europe’s most colorful and vibrant festivals in the summer of 2010, These being The Guca Festival in Serbia, and the Natibongo festival in the city of Cividale North East Italy, The dance troupe covered unprecedented mileage by air and road to able to take part in both events in its record breaking International touring season in 2010. Every year in August the sleepy town of Guca in Serbia turns on the world’s wildest bash lasting ten days with over twenty hours of partying per day, the air is filled with the sound of Gypsy trumpets, the streets are overflowing with people dancing and drinking, while tents and campers fill the beautiful surrounding green hills, no words can describe the atmosphere and mayhem of Guca, in 2010 the festival celebrated its 50th anniversary, its far more than just a trumpet festival for the world’s premier players, it is also rich in traditional and contemporary music and dance and offers many other diverse art programs, in 2010 over 300.000 spectators attended, Descendance became the surprise hit of the festival and completed countless media engagements and created special fusions with Serbian musicians and dancers for TV, however the world’s best trumpet players still could not manage how to master the didgeridoo. 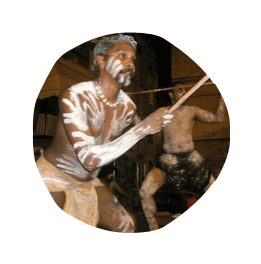 The Natibongo Festival in Italy 2010 honored the didgeridoo of Australia and the Rhythms of Afro percussion, the festival has been running for nine years and was finally able to secure an indigenous dance company from Australia a dream the organizers have held since the festivals inception, the location of the festival is in the beautiful city of Cividale Del Friuli north east of Italy, Venice being the closest major city. Descendance headlined the festival with two powerhouse one hour performances which included audience participation for the many European didgeridoo players on site, the festival was held in a serene clearing in a forest next to the main stage where there was space for free camping, good catering and bar facilities were also available, with interesting market stalls. The festival enjoyed a record attendance for 2010 while Descendance’ s love affair with Italy continued having already toured three times since 2009. 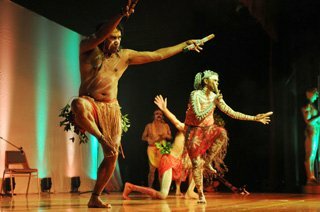 The Descendance tour of Serbia and Italy was made possible with the assistance from The Australia Council for the Arts. Descendance made its first return to Russia since 2005, this time it ventured outside Moscow to become the first Australian act to perform at The Arkhangelsk Festival in far North Russia. The city of Arkhangelsk lies on both banks of the Northern Dvina River near its exit into the White Sea in the far north of European Russia, the city districts spreads for over 40 kilometers along the banks of its river. Arkhangelsk was the chief seaport of medieval Russia and has a population of over three hundred thousand. Descendance joined performers from France, Argentina, Czech Republic, South Africa, Switzerland and Russia to make the 2010 festival a memorable event attracting over 200,000 spectators, locals had the opportunity to appreciate the street shows in more than 15 locations throughout the city. The hit of the festival was no doubt the traditional carnival for the performers who paraded around the city followed by thousands of spectators; this event opened and closed the Festival. Descendance was honored to present performances also in the biggest indoor venues. It was difficult to sleep with all the after show parties and the amazing hospitality of the local Russians, Arkhangelsk also being one of the few regions in the world where they experience 24 hours of daylight (White Nights). Descendance was invited as special Guests of Honour for the 2010 Australian Film Festival held in Mauritius, which also included a tour of Seychelles, the festival was presented by The Australian High Commission in Mauritius May 2010 as part of the Embassy Road show which is a continuous touring film festival showcasing Australian films organised by Australian Embassies and High Commissions around the world sponsored by the Department of Foreign Affairs & Trade and Screen Australia. One of the most beautiful and spectacular places in the world, Mauritius has a population of just over 1 million people, while Seychelles has approx. 90,000, these countries are a fusion of Indian, African, Chinese, and Europeans producing a pungent brew of races, languages, religions and eating habits. Mauritius was thought to be discovered by the Portuguese between 1507 and 1513, while Seychelles is a comparatively young nation which can trace its first settlement back to 1770 when the islands were first settled by the French, the tour was a great success for Descendance with healthy media coverage and appreciative audiences, The tour also received generous support from Mauritian and Seychelles Airlines, 4 Points Hotel, and Meridian Hotels. Descendance made its 6th consecutive annual tour of the Honolulu Festival in March 2010, with performances also on the Islands of Maui and Hawaii (The big island). The performances and audiences varied, from the grandeur of the Honolulu Festival parade to over 100,000 people on a moving stage, to a theatrical show at The Palace Theatre in Hilo, other performances included intimate workshops and performances for school children, and local Hawaiian audiences in Maui, all the events were well received and confirmed Descendance’ s high profile and status in Hawaii. The tour was made possible from our sponsors Hawaiian Airlines, The Honolulu Festival, The Australian Consulate Honolulu, Outrigger Hotels and The Palace Theatre in Hilo. Descendance completed its fifth consecutive year of touring the beautiful islands of Hawaii (2005-2009), once again headlining the spectacular Honolulu Festival, performing for schools all over the island of Oahu, a public performance at the beach walk Waikiki, and completing its itinerary at the Palace Theatre in Hilo on the big Island of Hawaii. Hawaii has seven magnificent Islands, Oahu (Honolulu), Kauai, Molokai, Lanai, Maui, Hawaii (the big island), and Niihau (the worlds most expensive private island). Hawaii is situated in the Pacific Ocean in the world’s most remote region; the weather is hot and tropical all year round with lots of rainfall. and is a state of the USA. The 2009 tour was Descendance’s most successful to date, each year exceeding the previous, and for the second consecutive year the group was awarded the best contribution trophy at the festivals gala dinner. In its five years of touring the flower islands; Descendance has now performed for over one million locals and tourists, thanks to the incredible numbers generated by The Honolulu Festivals street parade, something like a Gay & lesbian Mardi Gras, but with a cultural angle, Descendance performs live on a moving stage at regular intervals down a five kilometre strip that leads to the famous Waikiki beach. Many of the Hawaiian children in Oahu in the remote areas of the island got the chance to experience Aboriginal and Torres Strait Islander culture for the first time, the appreciation, love and energy shared with these children was gratifying and made the 2009 tour really special. The 2009 tour was again made possible with generous contributions from Hawaiian Airlines, The Australian Consulate (Honolulu), The Honolulu Festival, Outrigger Hotels, and The Palace Theatre (Hilo). After performing in 36 countries and 150 cities around the world, there is no doubt Hawaii is still Descendance’s number one destination in the world. Descendance returned to London for the first time since 2003 to represent Australia at the highly anticipated Toast Festival an annual celebration of culture, food and sport from South Africa, New Zealand and Australia, 2010 saw healthy attendances boarding on 10,000 fans per day basking in the beautiful English summer weather, the event was held at Clapham Common just outside of central London. Australia was well represented with international superstars “Sneaky Sound System” Ned Walker and band, and Australia’s most traveled cultural act Descendance, by the time “Sneaky” hit the stage the audience was well on their way and their performance went off…Descendance received great support from the audience and held the audience captive on the big stage as many were experiencing Aboriginal culture for the first time. Descendance also got a taste of the historic Lords cricket ground, the spiritual home of cricket, a private corporate show was held for five hundred of the world’s leading tycoons of the mining business, Descendance had only recently completed a show for Australia’s BHP Biliton in the Port of Spain Trinidad, the audience received a high energy and informative performance which held the businessmen captive and wanting more information about the culture, and showing a new found understanding and respect. Each one of Descendance’s fifty tours around the world has bought about its own unique kind of magic; every country and city has given something and taken something, the people, places and experiences have been priceless; many times the company has gone out on a limb and taken its chances and won, a combination of doing what you love with hard work and discipline goes a long way to dreams flowering. London is truly one of the world’s top five cities, with its architectural opulence, culture and history, with captivating attractions like Buckingham Palace, Piccadilly Circus, Big Ben, Trafalgar Square, Westminster Abbey, London Eye, British Museum, National Gallery, and The Tower of London, Descendance also made a visit to Abbey Road Studios where they were mistaken for the Black Beatles?? 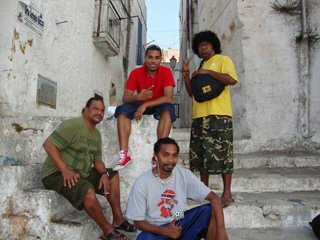 2009 has seen Descendance already complete tours of ROME, HAWAII, TRINIDAD and LONDON, at present they are in The ARAB EMIRATES in soaring 50 degree temperatures holding down a seven week residency. After touring 36 Countries and 150 cities in recent years it would be a cliché to say The Caribbean could possibly be a favorite destination for Descendance, but some of the members of Descendance felt this way in beautiful Trinidad in the steamy tropics with its exotic fusion of African, Indian, Middle Eastern, European, and local indigenous peoples, add all these customs, cultures and religions into a population of 1.5 million people and surround them in the pristine waters of the Caribbean, and you have a recipe for great music, dance, food, lifestyle and parties. 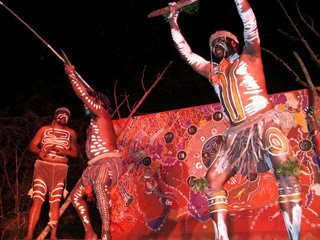 Descendance went into partnership with The Red Earth Festival in Trinidad, with support also coming from The Australian High Commission, BHP Biliton, and the Carlton Savannah Hotel, together producing the first ever official Australian indigenous tour in the Caribbean. 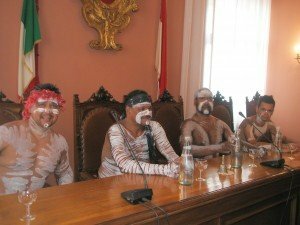 The tour was an undeniable success, with media and audiences totally fascinated with the songs and dances of Descendance, standing ovations and encores were the order of the day, the didgeridoo became an instant hit in the Caribbean; however Descendance could not find one didgeridoo or player in Trinidad? Descendance have never been treated with so much hospitality and love, everyone from the Hotel staff, to drivers, event organizers and audiences worshipped the performers and this inspired Descendance to give everything they had in a hectic and busy schedule. 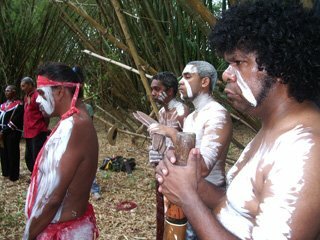 The Red Earth Festival provided breathless and intoxicating locations to showcase Descendance Concerts at Chaguaramas National Park in thick undergrowth of Bamboo forests; it also presented a multi cultural smoking ceremony which Descendance was part of which proved to be a moving experience for all involved, performances for school children of were also a great success. Descendance just missed President Obama’s visit to Trinidad but the buzz was still in the air, yes the Caribbean and Calypso life is as intoxicating as the local rum, the tour concluded with director Jose Calarco visiting Las Vegas holding talks with organizers of a proposed Australian themed mega production beginning development shortly. 2009 has seen Descendance complete performances in ROME, HAWAII, TRINIDAD, LONDON, and now its longest obligation for the year, 45 days in the searing heat in the Summer of ABU DHABI, Abu Dhabi is situated in the Middle East coming under the banner of the United Arab Emirates, with a Population of aprox 5 million, Islam is the official religion of the UAE, which is widely practiced by Emirate nationals as well as expatriates originating from other Arab countries, Pakistan, Africa and India, amongst others, the region is best known for the famous city of Dubai (the New York of the Middle East). 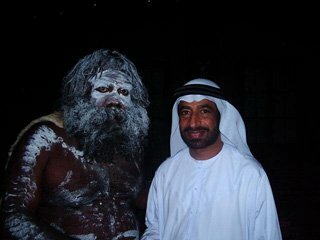 Abu Dhabi Tourism Authority welcomed Descendance (Australia), The Native Nations Dance Theater (USA), and the Zulu Nation Theatre Company (South Africa) at its Cultural Heritage Pavilion at The National Exhibition Centre (ADNEC), this was only one part of an extravaganza that encompassed a full range of exciting family activities. All three dance theatre groups wowed Middle Eastern audiences and gave valuable insights into some of the world’s most spiritual cultures. Oil was first found in Abu Dhabi in the year 1958. Since then, this city has never looked back. It has progressed at a phenomenal rate as one of the biggest oil suppliers of the world. After independence of the UAE from British rule in 1971, the city completely changed its outlook – skyscrapers replaced modest mud huts, the culture of Abu Dhabi became more progressive, and oil wealth knew no bounds. After a grueling 45 day contract in Abu Dhabi in the United Arab Emirates in sweltering conditions, and its busiest international touring itinerary ever, the reward for Descendance was a magical summer in South Italy in the beautiful region of Puglia, truly of Europe’s most spectacular places. Descendance was invited to participate at La Ghironda Festival, with performances in the picturesque cities of Otranto, Bari, Taranto, Grottaglie, and Ceglie Messapica. Ghironda was born in 1995 with the aim of promoting the meeting among different cultures through music and art from every corner of the world, the festival is now known worldwide, 2009 saw over 500,000 people attend, with Descendance holding the flag once again for indigenous Australia and doing a remarkable job, as well as the most performances from any of the groups that attended, many of the Italian audience’s experiencing the Aboriginal culture for the first time. After being away from Australia for 3 months and working everyday, Descendance relaxed for a few days in Rome before catching a train to Fasano South Italy, and staying on a scenic country resort in the famous little town Alberobello, where the group recharged its energy before the hectic program begun, sleep soon became only a memory as daily performances at 9pm and Midnight took place, after the concerts all the groups sung and celebrated on the long bus journeys home and formed a wonderful camaraderie, Many of the performers were too hyped up to sleep arriving home at 3 and 4am and sung to the dawn of the new day, it was a memorable time that will long live in the hearts of all whom participated. Descendance began 2009 with a magical trip to Rome to help launch Baz Luhrmann’s epic film “Australia” featuring Nicole Kidman and Hugh Jackman. Despite the mixed reviews around the world there is no doubting Australia is possibly the best film ever made in this country and it is almost impossible to walk away from the movie without shedding tears and being taken on an emotional roller coaster. The movie reached as high as number three in Italy, and at the glittering launch in Rome the movie received a thunderous ovation, Italian audiences are passionate and wear their hearts on their sleeves. Descendance were fortunate to be accommodated in the same street as the Pope’s residency in the Vatican City, to wake up each morning to see the Vatican surrounded in mist was a surreal experience, And to hear the pope deliver a live speech was also a special moment, despite what ones religious views may be. Whilst in Rome Descendance took in the special sights of the Coliseum, Vatican City, Trevi Fountain, Venice square, and the Pantheon, as well as making a trip to the beautiful city of Florence, the food in Italy of course is second to none with a wide variety of Antipasto’s, Italian Breads, Pizza, 650 different pasta dishes, risottos and rice dishes, fish and meat dishes, cured meats, and hundreds of cheese’s, wines, deserts and pastry dishes, and of course the worlds best coffee. Italy is truly a special place; imagine one country in the world holding over 50% of most worlds most prized architectural and historical treasures? Of course there was no need for Nicole Kidman to play the didgeridoo on this occasion after her recent faux paux on German television, to Nicole’s defense she was unaware of the instruments cultural protocol. Descendance’s love affair with Eastern Europe continued with their tour of Bulgaria in October 2008, having now toured almost every country in the region. Major theatre performances took place in the countries three main cities Sofia, Plovdiv and Varna, while the media coverage was exceptional with six major national TV spots reaching in excess of 4 million viewers, including an interview and performance with Bulgaria’s most famous and ambiguous personality Aziz on his top rating show. Not even a 36 hour marathon journey to reach their destination, which included an overnight stay in Abu Dhabi in the Middle East, could dampen the enthusiasm of the new look Descendance which included exciting youngsters Ryka Satrick and Darren Compton, mixed in with experienced veterans Ronaldo Guivarra, Vivian Anderson and Jason Sandy, complimented with their beautiful women’s team of Beatrice Sailor and Barbra Drummond, the tour was full of laughter, joy and great times and was produced by Australian Terry Douglas now living in Bulgaria, the audiences were warm and appreciative with standing ovations at each performance . Descendance Producer Jose Calarco composed a music score for Bulgarian folk singer Silvia Entcheva, the piece was a traditional folk standard titled “Yankin Brat” the song was blended with didgeridoo and modern arrangements, and is gaining plenty of interest and appraisal in Bulgaria. Bulgaria has a population of close to 8 million, with beautiful countryside and Mountains and opulent churches with Plovdiv being one of the worlds oldest cities, Bulgarian Orthodox is the major religion and Hollywood has set up a thriving film business in the country. 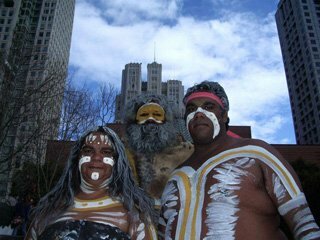 Descendance Aboriginal & Torres Strait Islander Dancers recently completed their third consecutive year (2006-2008), promoting Australia Week in New Zealand. The “G’Day” New Zealand concept begun in 2006, and is still developing and gaining popularity, celebrating food, wine, culture, tourism and sport from Australia. The week of celebrations reached new heights in 2008, kicking off with the Oz Talk Travel Expo which exceeded all expectations with a healthy attendance on a rain sodden Sunday in Auckland, with Descendance performing throughout the day to over six thousand locals. All the events in 2008 were well attended, highlights included The OZCARS, which was an awards event for Australian travel agents, The Spirit of Mateship dinner where Descendance had the honour to perform with Australian Rock Legend, Glen Shorrock (Little River Band), the Rosemount Great Australian Lunch, with Tim Finn (Split Enz), and the live TV breakfast performance with indigenous cooking maestro Black Olive were all well received. Descendance vocalist Ronaldo Guivarra was invited to sing the National Anthem for his country for the first time at “The Spirit of Mateship dinner”; his rousing rendition was warmly received. The hostilities between Croatia and Serbia have been well documented in the chronicles of 20th century warfare; Croatia finally declared its independence from Yugoslavia in 1992. The media response for Descendance was also a revelation, with four prime TV airings, reaching an audience of five million in the Balkans. Australia week in Zagreb was a well organised promotion which coincided with the Australian Film festival; there were also forty wine industry experts and cuisine from Australia for the locals to sample. Descendance revelled performing in Zagreb on Australia Day and witnessed the synergy Australians share with Croatian people, members of the group caught up with Croatian soccer legend Davor Suker, and reminded him that Australia eliminated Croatia in the 2006 World Cup, the only dark spot on the tour was the untimely death of Australian acting legend Heath Ledger while the group was in the country. After completing the Croatian leg, Descendance made the five hour road trip to Belgrade; the sight of bombed buildings from the NATO dispute in 1999 was unnerving, there was an overwhelming curiosity about all things Australian in Serbia, after all Novak Djokovic had just won the Australian Tennis Open, and as fate would play its hand, the last night of the tour Descendance dined with Novak and presented him a didgeridoo. School performances in Belgrade proved to be enjoyable and stimulating, the children were as enthusiastic and receptive as any audience Descendance have performed to, the orphanage show was a heartfelt experience for the group, and saying goodbye to the children was an emotional moment. The final performance at the beautiful Yugoslav Theatre was a sell-out, and was met with thunderous applause and appreciation; Descendance was in Serbia at an interesting time with the elections taking place and Kosovo (a Serbian territory) granted independence. It was one of the more enjoyable tours Descendance has undertaken; thanks to the wonderful women of the Australian Embassies in Zagreb and Belgrade, who coordinated the tour, winter in the Balkans was fairly mild, no snow, or freezing conditions, the Turkish coffee kept Descendance warm and awake. 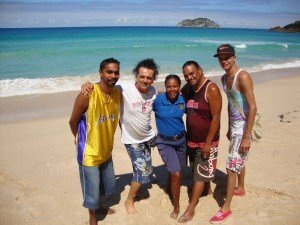 After four years of touring Hawaii, there is nothing much more to be said for Descendance’s favourite world destination, not only is the dance troupe a major headline act here, but the respect and support they receive in Hawaii is second to none. 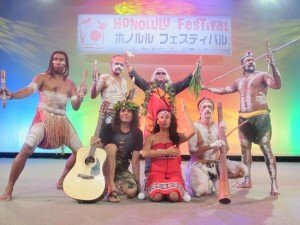 The 2008 tour was once again colourful, stimulating, diverse, educational and emotional, culminating with the induction and acknowledgement of Descendance into the Honolulu festivals hall of fame. 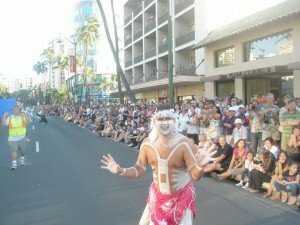 The spectacular Grand Parade down Waikiki Beach is always the highlight of the Honolulu festival, performing to an audience in access of 200,000 people, who line the streets all the way down to Hawaii’s most famous beach. The media is always supportive of Descendance tours, with prime TV appearances this year on Hawaiian Channel’s 2 and 9, a live radio concert for leading personalities Perry and Price, and their first ever Internet Concert at The Ala Moana Hotel. The 2008 Hawaiian tour was the year for the children; Descendance presented work shops for many of the schools of Honolulu, and staged a concert at Pearl Harbour for the children of the US military who are stationed at the historic post. The Hawaiian children who greeted the group with wreaths of flowers and a hula dance at the Beach Walk performance at the Ohana Islander Hotel, was an emotional experience; the children also joined in on the aboriginal dancing with great vigour and enthusiasm. The tour had a strong network of supporters which included, Hawaiian Airlines, Austrade, Honolulu Festival, Palace Theatre, and Outrigger hotels. Australia Week in Vancouver Apr 2008 was the third project in Canada for Descendance; the previous trips were for Australia Week n Toronto in 2007, and the collaboration works with Native Indian Dance Theatre, “Red Sky” which took Descendance across much of the country for the first time in 2006. 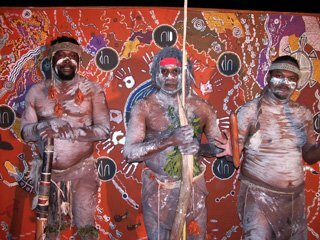 Tourism Australia again delivered a highly professional presentation and promotion of our country to the locals, with Descendance and Black Olive (Chef), providing the indigenous ingredients of Dance, Song, Music and fine food. Highlights for the week included the opening reception at the impressive Science World Theatre, The Surfs Up (Foam Party) at Celebrities Nightclub, Planet Oz Travel Expo, and various events showcasing Australian films and wines. Canada or Kanata (indigenous name for settlement), is one of the world’s most beautiful and largest countries in the world stretching for 9,971,000 square kilometres, with Vancouver being the third largest city. 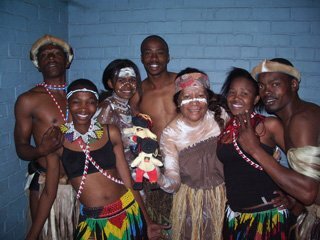 The Descendance Africa-Baltic’s tour 2007 was a journey of the sprit heart and mind, and a lesson in coordination, endurance and faith. Imagine a journey that would take you 50,000km through the air, road and rail? Descendance were set to perform in seven different countries in six weeks half a world apart, they had to deal with nine different currencies, vaccinations for Africa, apply for visas, there were language barriers, different time zones, tight transfer schedules, varying weather conditions, new cuisines to digest., and the group still did not have enough money in the budget. Even though Descendance had performed in many countries and were vastly experienced, this would be their biggest test yet, maybe even a make or break tour. 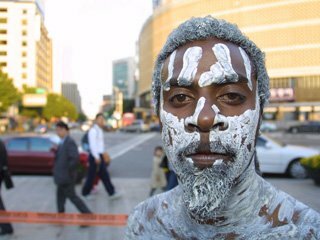 For years the company had been working on a tour through the Baltic states, and in 2007 all the pieces came together, but when a late opportunity came for a detour to South Africa and Ghana through the Department of Foreign Affairs, they knew it could be a once in a lifetime opportunity to visit the motherland, the land of black people, music, culture, the poor and underprivileged, yet happy and vibrant people. Descendance Dance Company showed great courage and dedication to complete this gruelling tour, fighting Dysentery, flu’s, exhaustion, jet-lag and dehydration, yet the spirit and camaraderie of the group could not be broken, and in the process they had the time of their lives and were treated with respect and dignity everywhere they went. The tour was the most successful to date, reaching over 100 Million people thanks to televised concerts through Russia & Africa and the whole eastern block, with coverage in over twenty countries. Standing ovations and sold out concerts greeted them throughout Europe, Descendance had been well promoted and anticipated in the region, and completed every date over the six weeks without any cancelled shows. The Tour had too many highlights to recollect all of them, but great memories came from performances in the, blood spilt streets of Soweto (South Africa) where apartheid was born, to epic stadium concerts in Independent Square (Ghana), and Vitebsk Arena (Belarus), the summer festivals in Poland, Lithuania, Latvia and Estonia were packed to the rafters and were greeted with standing ovations and fanatical support which they could not have imagined, performing at The Australian Ambassadors residences’ in Pretoria (South Africa) and Accra (Ghana) made them feel like they were at home, the fusions with the African drumming legend Mustapha Tettey Addys and the Dance factory were surreal experiences, but the smiles on the faces of the children of Ghana and South Africa at the workshops were the most priceless memories. During the tour Descendance got to travel and perform in some of the most spectacular cities and towns in the world, in Belarus, Vitebsk and Minsk, in Poland-Wroclaw and Warsaw, in Lithuania, Pazaislis, Palangos, and Vilnius, in Latvia-Riga, in Estonia, Paide, Viljandi, Parnu, Tartu, Tallinn, and Toila, in South Africa-Soweto and Pretoria and in Ghana, Kokrobitey and, Accra. It was a dream realised to finally perform in the country that produces Flamenco culture; after all it was this art form which led to the association between Sean Choolburra (Naroo Dancers) and Jose Calarco (Flamenco Dreaming) when their hit show “Antipodes” ran for a record breaking two year season in Sydney, being the world’s first fusion of its kind, this association would latter lead to the birth of Descendance. Descendance arrived in Barcelona knowing they were a feature act amongst a vast array of groups from all over the world; the performance was staged in one of Barcelona’s most beautiful old castles, The National Arts Museum of Catolina which sits on top of the city. Descendance were involved in the extravagant finale of the event where their performers were forced to learn some Flamenco dance steps from legendry Spanish choreographer Mulnero, they used their skills and knowledge from the Flamenco Dreaming experience to construct a stimulating finale to a spectacular show, using flamenco rhythms on didgeridoo and clap sticks with the Spanish hand and feet syncopation, while the sixty dancers ran amok. Flamenco existed as far back as the 16th century. The flamenco song (or cante, as it is known) involves a synthesis of at least four cultures: The Gypsies, the Moors, or Arabs, the Jews, and the indigenous Andalusians. 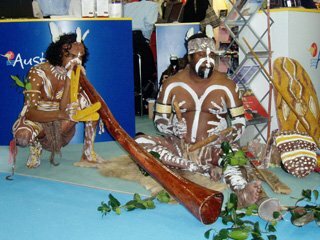 Spanish Audiences were enthralled with the indigenous culture of Australia, and were moved by the Didgeridoos captivating tones. 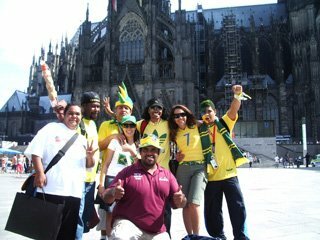 Descendance completed its second consecutive year performing at the: “G’Day New Zealand” campaign for Tourism Australia in Auckland Apr 2007. Australia week in Auckland is always highlighted by the Lindemans Longest Lunch at Te Wero Island, which is becoming a popular annual event for the kiwis, getting to eat, drink, and be stimulated by all things Australian. Other highlights for the week included performances at Auckland Zoo, Auckland Museum, and the Australian Film Festival at Rialto Cinema, Descendance also hosted a special Anzac Day performance, and a string of educational school shows where cultural exchange took place, including some great Maori dancing from the school kids as a cultural gift to Descendance. Descendance showed its depth of quality dancers, having two International teams touring at same time; Nicole Willis led the New Zealand Team, while Jose Calarco was in Barcelona with a second Descendance dance team. After a gruelling three week theatre tour of Hawaii, Descendance received a late request to fly home via the UAE to perform a promotion for Etihad Airlines in Abu Dhabi; the airline was launching and marketing its new direct flights from the UAE to Sydney. Having never performed in this part of the world Descendance agreed to participate in the event, only problem was that they were required to fly half way around the world in two days to make the launch on time. Hawaii is already almost a day behind many parts of the world, so they needed to fly west to gain time and beat the clock, they finished a show on the tiny island of Kauai and made a mad dash to Honolulu, from there they just made the connecting flight to San Francisco, followed by a trip to Amsterdam and finally onto Abu Dhabi on the day of the performance. 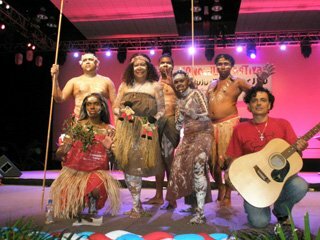 The show was extremely well received by an audience that had never seen indigenous culture from Australia before, after almost collapsing from the travelling ordeal they had one week in Abu Dhabi and neighbouring Dubai to relax and get over the hectic touring schedule of the past month, they flew home on the historic first direct flight to Sydney from Abu Dhabi where they performed one last time at a press conference on arrival. Once upon a time there lived a King called Kamehameha, he first became chief of the northern half of the island of Hawaii, and eventually he brought the entire island under his reign. The other Hawaiian Islands were controlled by other kings, but Kamehameha conquered and united them becoming ruler of all the islands by 1810. The first residents of Hawaii reached the islands approximately two thousand years ago; they may have come from the Marquesas Islands which are north of Tahiti. Many more Tahitian immigrants arrived in Hawaii in the 14th and 15th centuries. Hawaii was largely forgotten by Europeans, and then rediscovered in 1778 by British explorer James Cook. Captain Cook named Hawaii “the Sandwich Islands” after his sponsor, John Montagu, the fourth Earl of Sandwich, and the inventor of the sandwich. Hawaii has become the second adopted home of Descendance Dance Company after its third consecutive annual tour of the Honolulu Festival, coupled with major theatre performances on the islands of Maui, Kona, Oahu, and Kauai. To end the story where it started, King Kamehameha’s legacy still lives today, all over Hawaii Kamehameha Schools which only accept Hawaiian children are flourishing, and one of their most memorable shows was for these Hawaiian children on the island of Maui, the schools were founded by Princess Bernice Pauahi Bishop, great-granddaughter and last royal descendant of Kamehameha. From the Tropics of Palm Island in Northern Queensland Australia, to the snow and minus twenty degree conditions in Toronto Canada, this is what life in Descendance is all about, travel and variety, as they headed to Canada to promote the first G’Day Toronto event for Tourism Australia. The Australian tour contingent included Keith Urban, Silverchair, The Living End, Bindy & Terri Irwin, The Black Olive and of course Descendance. The G’Day event was held in a specially erected Biosphere in central Toronto complete with its own version of our Opera House and Harbour Bridge covered in snow, the event became a runaway success with sold out performances and impressive attendances, Australia Week certainly brightened up a chilly Toronto and gave the locals a good overview of our country. The snow and cold did little to dampen our enthusiasm, the group had many inspirational moments throughout the tour, none more than the history making indigenous performance with dancers from Arnhem Land ,where they combined the two styles in a spectacular cross cultural indigenous celebration at the Sounds of Silence dinner, where are very own Black Olive prepared the tucker. Descendance was honoured to be given a private ceremony from Elder Vern Harper of the Cree nation in Toronto, he gave them his blessings in a traditional ceremony and they were enlightened by his great wisdom, other special moments were the performance at The Hershey Centre Hockey Arena which was a charity event for breast cancer with the entire auditorium filled with pushbikes, participants where asked to pedal for twenty four hours to raise money for charity, while the workshops conducted in Toronto drew healthy attendances. 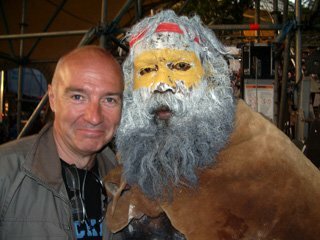 Arthur Turtle Tamwoy the favourite son of Descendance and one of Australia’s most travelled performers represented the company with his powerful one man shows twice, Sept and Oct 2006 in one of Descendance’s favourite destinations, Hungary, the tour was in association with The Australian Embassy in Budapest and BPS promotion. With a population of ten million and a handy location in Central Europe, Hungary is an ideal place to centralise while travelling around Europe, surrounded by seven countries, Turtle made a lasting impression with audiences in Hungary at the Australian Wine Festival and The Education Festival in Budapest, being a virtuoso in song, dance and didgeridoo playing. Descendance was proud to be part of the Discovery Channel’s Atlas series, which is their most ambitious global project to date. Discovery Atlas is a landmark series which takes viewers to thirty countries utilising captivating photography and high quality production values to capture the world like never before. Atlas Australia is colourful, energetic, with some of the best cinematography ever shot in this country and narrated by Russell Crowe. 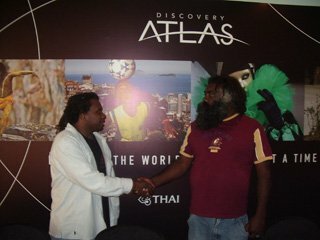 Atlas Australia became the biggest all time release for a film or documentary ever to come out of this country, being broadcast to a staggering 170 countries. 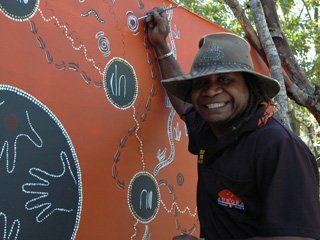 The documentary features performances and story telling from Descendance senior members Arthur “Turtle” Tamwoy and Nicole Willis, with contributions from the Descendance team in Alice Springs central Australia. Descendance launched the event in Sydney and was invited by Discovery Asia to launch the program in Hong Kong and promote it throughout Asia. The Hong Kong launch was another success for Descendance and they thoroughly enjoyed their stay in this colourful and crazy city of over seven million people with the landscape filled with skyscrapers and neon lights, Hong Kong is certainly the New York of Asia. Descendance successfully completed two major world events in Europe this summer, in Germany at The World Cup Soccer, and in France as a headline act at The International Indigenous Forum in Pau. The planning and coordinating to successfully complete these two assignments was rather complex and required Planes, Trains and Automobiles all around Europe. Life on the road may not be as glamorous as one imagines, the journey begun with a nine hour flight to the tropical dry heat of Singapore, with the plane meals churning in their stomachs and no sleep, fourteen hours latter they arrive in Paris in a delirious state and begin a six hour road journey from Paris back to Cologne in Germany, looking like a pack of escaped criminals, they are pulled over by Police on the border of Belgium and have their passports confiscated for one hour, they are finally cleared and continue the journey, they become lost for over one hour trying to find the Hotel in Cologne, they finally check in after leaving Sydney some thirty hours ago, and they say getting there is half the fun? The City of Cologne and its beautiful central monolith “The Dome”, a splendid Gothic Cathedral was the backdrop for their big outdoor World Cup performance prior to the Australia vs. Brazil match, the atmosphere in Germany was emphatic; it was truly the centre of the Universe at the time of The World Cup, tens of thousands of drunken soccer fans crammed the cities walk ways singing football hymns day and night, although their performance was well received and they had a wonderful time in Germany they were already focussing on the importance of The International Indigenous Forum in Pau (South of France), Soon they are on a train back to Paris with all their luggage, followed by an overnight Train to Pau without sleepers. 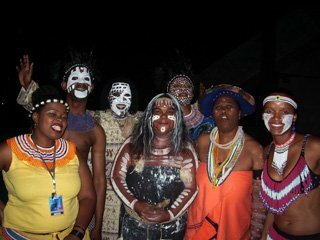 The Forum International in Pau was worth all the hardships and travel, it was a very important event for indigenous people, and helped get there message and struggles to the wider world through extensive media support. The one week event proved to be as enlightening as anticipated as some of the world’s greatest cultural music acts and prominent indigenous leaders poured into the small picturesque city, the streets were colourful and vibrant and humanity and camaraderie was in abundance as cultures of the world rubbed shoulders, shared ideas, performed and spoke openly about critical issues, Descendance headlined many of the concerts and often invited other cultures to join them on stage. Descendance toured New York City primarily to perform at the United Nations 5th session of the Permanent Forum on Indigenous Issues; this is the world’s most important gathering for the survival of traditional culture and discussions on third world issues. 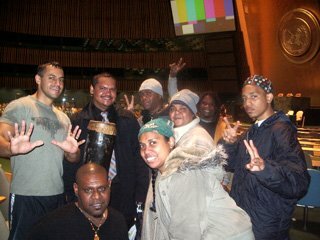 It was a surreal experience for Descendance to enter the beautiful General Assembly hall of the UN where for years the world had seen Secretary General Kofi Annan deliver messages to the world; it was also a great opportunity for Descendance to showcase the power and pride of both Aboriginal and Torres Strait Islander culture on the world stage. 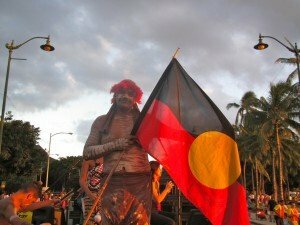 Descendance proved to be popular at the forum, with UN representatives from all over the world wanting photo opportunities and more information on Aboriginal people’s plight in Australia. Connecting and performing with the Local Native Americans of Manhattan was important, and Descendance was there for the final performances at the historic American Indian Community House, an institution in Manhattan for over thirty years. Descendance were very fortunate on this tour to have former Naroo Dance Company (now Descendance) members, Cameron McCarthy, Taryn Beatty and Ryka Satrick all living in New York City at the time, of course all joined forces and were able to give New York some of the most explosive and energetic Aboriginal and Islander shows they have ever performed. Cameron McCarthy and the Australian Consul General in NYC helped co-ordinate the Descendance tour, with contributions from Australia Post, News Corporation, DFAT, and Qantas. 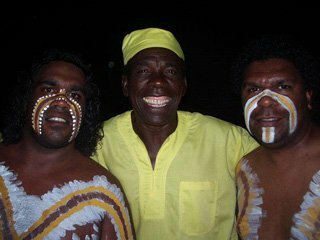 Cameron McCarthy was a popular indigenous performer in Australia, now working for the consulate in NYC. The tour finished with a party at the Australian Consulate with the arrival of the “Convicts” a gay Rugby Union Team from Australia who was in New York for a Gay Rugby Union Tournament; Descendance attended the function in support of the team which included four indigenous members. 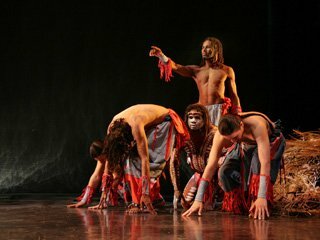 The production of “SHIMMER” was a collaboration between leading Canadian Indian Dance Theatre group “Red Sky”, and Descendance Aboriginal and Islander Dance Theatre, the work was an ambitious fusion project which spanned a period of three months, which included a rehearsal period followed by performances in four Canadian cities. “SHIMMER” featured dance and live music, and captured the essence of contemporary Native Canadian peformance with contributions from the OJIBWAY, CREE, MIXTECO, ODAWA and MOHAWK tribes, with Descendance providing the Aboriginal and Torres Strait Islander cultures. The project had a contemporary overview but wias grounded in tradtional, it was Choreographed by Albert David (Descendance) and Michael Greyeyes (Red Sky), and produced by Red Skys Artistic Director Sandra Laronde. Red Sky and Descendance first met at”The Dreaming Festival” at Woodford in Queensland in July 2005. Sandra Laronde was inspired by the Descendance performance,while Descendance were equally inspired by Red Sky’s “Caribou Song”, this is where initial talks between Sandra Laronde and Jose Calarco took place to produce something together.. The project was funded by the Canada Council, and toured through Toronto, Ottawa,Vancouver and Banff, the show received glowing reviews and standing ovations each night and was a real pioneer work in Canadian dance circles. “So where the bloody hell are you”, this was the catch cry on the winter streets of San Francisco, where Tourism Australia was promoting the launch of its multi million dollar ad campaign, and helping create awareness of the new direct Qantas flights between the two sister cities Sydney and San Francisco. 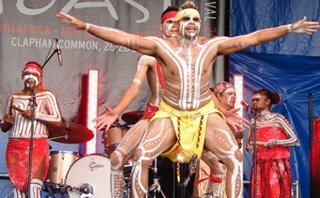 Winter turned to summer miraculously as Descendance performed a series of outdoor concerts at the centrally located Union Square giving the locals a week to remember and its first taste of world class traditional Aboriginal dancing. The San Francisco promotion included a hand made bridge which was Half Sydney harbour and half Golden Gate, a giant pavlova, and a poor old Kangaroo that looked like it was ready for retirement, San Francisco is a charming American city to visit, and very similar to Sydney with a touch of Melbourne, famous for the Golden Gate Bridge, Alcatraz Prison, and endless trams running through the city, it’s a colourful and vibrant place but like all major cities there is to many homeless people littering the streets. Descendance performed in their second Honolulu Festival in 2006 with a series of powerful and dynamic concerts for television, radio, and at the opening launch of the festival at the Honolulu Convention Centre. The finale of the festival is always the highlight; the Honolulu Street Parade down Waikiki Beach has become an institution, 300,000 people line the streets down to the famous beach with an endless stream of colourful floats, filled with performers from around the Pacific dancing and singing, the five kilometre drive is broken up at regular intervals for quick performances at key stops, the singers and didgeridoo players have the comfort of sitting on a moving truck all amplified, but the unfortunate dancers must perform on the street around our float in bare feet, but the appreciation of the large crowd and scores of attractive Hawaiian women kept them motivated. This year Descendance had the wonderful experience of flying to the remote island of Molokai, this is the island that claims “the birth of the Hula dance”, it’s a picturesque tropical island with opulent serene empty beaches, and a healthy population of native Hawaiians still practicing their culture. 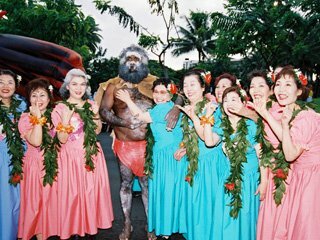 when the New England missionaries arrived in Hawaii in 1820 they sought to eradicate the Hula, they saw the Hula as vile and obscene, during this time a new Hula emerged, with the introduction of the ti-leaf skirt, and English lyrics in the songs, it was a much lighter and showier Hula designed for the benefit of tourists, but thankfully a recent resurgence of Hawaiian ethnicity has fostered renewed interest in the original traditional Hula. The tour was once again sponsored by Hawaiian airlines, with support from Austrade and The Honolulu Festival. New Zealand were celebrating their first Australia Week with a series of high profile corporate events in both Auckland and Wellington, the National Geographic photo exhibition in Wellington kicked of the campaign, it was a fascinating event with a breath taking selection of pictures from some of the World’s leading photographers, topped off by a performance from Descendance. Auckland was the prime location for most of the events, hosting the Trans Tasman business breakfast, The Australian Film Festival, and of course Australia’s Longest Lunch; Australia Week was co-produced by Tourism Australia and Creative Functions New Zealand. 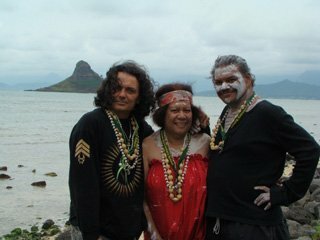 When Descendance dances on foreign soil they try their best to connect with the traditional land owners from that country to receive their blessings and support, they were fortunate to be invited to a Marae (Spirit House), once their duties with Australia Week were completed. 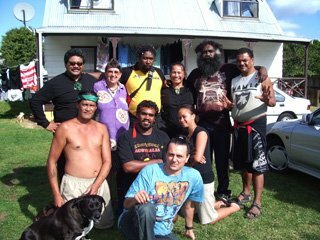 Descendance was blessed to be given this Mana (respect), they also received a Haka (dance), Waiata (song), Mihi (prayer) and of course Hongi (touch noses), and the day was enhanced by meeting their good friend Rawiri Paratene (Whale Rider) who they hosted in Australia. Today the Maori culture is flourishing, back in 1920’s the population fell to a dangerously low 15,000 through disease, it is estimated that there are fifteen principal tribes. The most frequently asked question about this tour is where is the Reunion Island? This stunning serene place is situated near the east coast of Africa (Mozambique) close to the islands of Mauritius and Madagascar. The Reunion is French owned even though they make up only 30% of the population; the remainder coming from India, Africa, China, Mauritius, Madagascar and other European races, French and Creole are the two languages spoke on the island, and Catholic and Hindu are the two main religions, the population is approximately 800,000. La Fowinaise is the towering Volcano on the island, La Fowinaise is active and around twice a year threatens; pristine beaches surround the island with breathtaking sunsets each night. The Artkenciel Festival is one of the most exclusive events in this part of the world, in 2005 they featured some of the best acts from six countries over four days, these included Australia, Africa, India, Zimbabwe, Madagascar, and Mauritius, the standard of the acts was astonishing, as culture is integral in the region. Descendance were the only dance company present at the festival, and of course the most unique and unknown of all the cultures represented, they found an unlikely partner also from Australia in Xavier Rudd, Xavier performed with Descendance, and visa versa, together the Australians became an irresistible team and the darlings of the Festival. 2005 was the final year of a three year contract Descendance held at Epcot (Experimental Protocol City of Tomorrow), which is situated in Disneyworld Florida, Epcot is one of the four major theme parks at Disney, the others being Magic Kingdom, MGM Studios, and Animal Kingdom, all four parks cover 122 square kilometres which makes it twice the size of the Island of Manhattan, Disneyworld is the world’s number one holiday destination; the property has 27 resorts, 55,000 employees, 2000 animated characters, and a staggering 41 million visitors each year. Descendance was the feature act at the Australia stand, at the 10th annual food and wines festival; the festival bought together 150 of the world’s leading chefs, and 109 of the world’s leading wineries, and has become the biggest wine fair in the world. 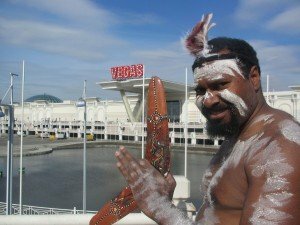 What is peculiar is Australia is only at Epcot for six weeks a year ?, while other major countries operate here 52 weeks per year, the Australian Government does not contribute any money towards the project, despite the fact that countries who operate annually increase their tourism by 400%. Australia first made its debt in EPCOT in 2003 and has since become the most popular country at this event, while Descendance was voted most popular show for 2003-2004. Descendance completed 120 shows and workshops in this time, and survived Hurricane Wilma, which hit Florida during the tour. 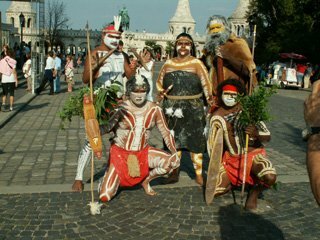 Hungary has embraced the indigenous culture of Australia like no other, 2005 being the second tour the company has completed here, this year saw Descendance perform for the first time at The “Sziget Festival” officially Europe’s biggest cultural event, set on an island in Budapest, the festival runs for one week and brings in 100,000 people per day, with the final day of the festival accumulating a staggering 300,000.Descendance without doubt was one of the best received acts at the festival and carried the Australian flag along with Natalie Imbruglia and Nick Cave. The tour included countless performances scattered in charming Hungarian cities, some over 700 years old with names that no English tongue could ever pronounce, like Szekesfehervar, Nepmuveszeti and Nagykanizsa. Descendance had informative meetings with Gypsy leaders from these areas telling them about their struggles for freedom, they also performed for children and families at Europe’s biggest inland lake at Balaton, completed events for The Australian Consulate, performed in Vienna and made eight television appearances on prime time to audiences of Millions, the one month long tour was in association with BPS International and The Australia Council for the arts. Descendance flew to Munich to begin rehearsals for the annual Midsummer Nights Dream concert at Munich Olympic Stadium; this is Germany’s biggest single night’s entertainment event of the year. Germany’s leading contemporary classical musical arranger and conductor Eberhard Schoener, wanted something new for 2005, and invited Descendance to fuse the didgeridoo into his classical works. A three day rehearsal period followed, many other cultural performers from around the world joined Descendance for this special occasion, and of all the memorable moments Descendance have had on the road, performing to 87,000 people at Munich Olympic Stadium, still stands as the biggest single audience they have performed to. Working with the legendary German conductor and former British pop sensation and Ultravox front man Midge Ure, was a sheer delight, The night concluding with one of the worlds finest fireworks displays, four floating stages on the river near the stadium carried enough explosives to begin world war three, as classical music blasted from the enormous PA systems, it truly was a Midsummer Nights Dream. Australia Week in Moscow was launched in 2005; Descendance on the invitation of Austrade accepted the offer to help promote Australian business in the booming Russian Markets.Getting to Moscow was a marathon thirty two hour ordeal, but the magic begun to unfold on arrival, the group was accommodated at the prestigious Radisson Hotel in Moscow which resembled a fortress, as many of the world leaders were staying there. Russia was celebrating the 60th war anniversary victory over Nazi Germany, even George Bush was there, everything was on high alert, and Descendance were in the middle of the madness. The whole world’s eyes were on Moscow at this time, and Aus-Trade used the opportunity to promote their event, this was also the largest trade event ever attempted by Australia in Russia. When the war celebrations begun on May 9th, Descendance were taking a dinner cruise down the Moscow River with the Australian contingent of Aus-Trade, the cities architecture was magnificent, millions of Russians lined the waters edges anticipating a fireworks display that would prove to be as big as World War 2 itself, while the group dined on endless courses of Russian food. The Russian hospitality inspired Descendance to new heights, the reviews and audience response exceeded all expectations, the memorable moments came from opening the great Moscow Circus, the Trade Show concerts, countless live TV engagements reaching millions, and performing for dignitaries of Australia and Russia such as The Governor General, Ambassadors, and ministers, and of course the KGB who attended the performance at Australian Embassy in Moscow. Descendance was the littlest business at Australia Week but made the most noise, and dominated the extensive media coverage captivating audiences and brining attention to the fact that Australia is the home of the world’s oldest living culture. Descendance Aboriginal and Islander Dance Company had the pleasure of performing at The Oz Talk Conference Luncheon before a thousand tour operators from around Australia and New Zealand on April 2nd 2005, the event was hosted by Proximity Pulse and Air New Zealand and was staged at the Auckland showground. An unexpected gift came on this tour, Maori singer Price Davis and the Destiny Church in Auckland invited Descendance to a church service, afterwards an army of the traditional Maori people of Auckland “The Ngati Whatua Ki Orakei” lined up and performed a Hakka so powerful the earth trembled underfoot, afterwards elders and warriors showered the group with love and respect, Descendance are forever in debt to the Maori people for this extraordinary gift. When it was time to go the tears were genuine, flying Air New Zealand was a wonderful experience, and they are right up there with the world’s finest airlines, Descendance should know as they have flown with just about everyone. Descendance was chosen to represent Australia at the 11th annual Festival of Honolulu which paid tribute to the countries of the Pacific. The first Hawaiian tour would be the Catalyst that would begin a love affair between Descendance and Hawaii that is still thriving today, audience sizes were generous and the heavy media exposure ensured a successful debt, when Descendance appeared on the front page of the Hawaii Honolulu Advertiser they had struck a chord with local audiences and captured their imagination. One disappointing aspect of Hawaii was the dwindling numbers of indigenous people; the famous Hula traditional dance industry has been over run by the Japanese who make up 30% of the population, the traditional people of Hawaii are down to less than one percent, and seeing authentic Hula is not easy anymore. Descendance highlight for the tour came when they headlined the Honolulu Street Parade to over 200,000 Hawaiians that lined the streets down to Waikiki Beach; the tour was sponsored by Hawaiian Airlines. Descendance departed to Los Angeles on January 10th 2005 to begin an extraordinary tour that would see them rub shoulders with Hollywood royalty. 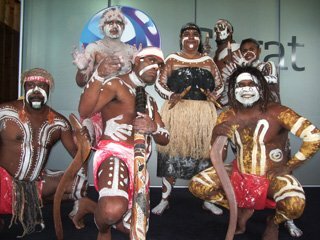 Descendance represented Australia at the “G’Day LA” Promotion for Australia Week 2005. The highlight of this tour without doubt was performing at The Black Tie Tribute Dinner for Nicole Kidman, Mel Gibson and Keith Urban on January the 15th, this dinner would become Hollywood’s hottest ticket, Australian superstar Delta Goodram also performed. Australian was all the rage in LA from January 15 – 23, in the lead up to Australia Day celebrations, the promotion highlighted Australia’s vitality as a place to visit and to do business with through a series of exciting events. Australia Week 2005 showcased all things Australian including food, wine, film, arts, fashion, lifestyle, indigenous culture and tourism. Descendance completed over twenty performances including shows with the late Steve Irwin, Australian celebrities had overrun LA for the event, Cate Blanchett, Geoffrey Rush, Olivia Newtown John, Jennifer Hawkins and scores of other actors and musicians flaunted Aussie power to the Americans, the hectic two week schedule was wound down in a sweat lodge with local native Americans at San Antonio. Descendance Aboriginal & Torres Strait Islander Dance Theatre completed six successful weeks at Disneyworld in Florida at the Epcot Centre (experimental protocol community of tomorrow) where it helped Australia become the most popular destination site for the annual six week food and wine festival, and won best show for 2004 from the forty countries represented. Epcot is a world village where the leading countries have permanent set ups with beautiful replicas of their architecture promoting their culture in dance, music, and food, this helps stimulate tourism and awareness in the USA. Australia is only represented for six weeks of the year, but after the runaway success of the partnership between Descendance and Southcorp Wines the Australia Village may have permanency somewhere in the future. Even though the Disney Experience was fruitful, the highlight of the Florida tour came from the exchanges and performances with the Seminole Indian Tribe at their reservation in South Florida, the tribe had never seen an Aboriginal performance before, they were so taken by the dancing they allowed Descendance to spend time on the reservation and treated them with respect and courtesy. The Seminole Indians were the only tribe never to succumb to the American Government, they never gave up the fight to keep their customs and land, and never signed any treaties, and today they have their own Casinos, Airport, Schools, Zoo, Museum and land. Don’t be fooled that the Seminoles have fallen into white mans material world, for this is not the case, the money is spent wisely and has only made them stronger and more organized surviving in the white mans complex world. 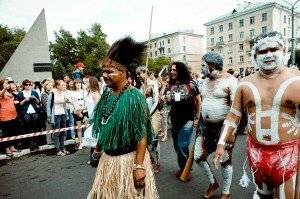 Today their customs are as strong as ever, their Green Corn Celebration goes for four days, no technology is allowed on site for the duration of the festival, the Seminoles celebrate with song, dance, law and traditional customs, and this helps them stay on their path to spiritual enlightenment and ensures the survival of their culture. 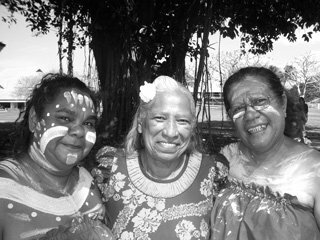 Descendance performed for the elders of their tribe and gave them Aboriginal gifts for the generosity they showed. Descendance finally received recognition on the International arena when they took out first prize in the Dance category, at the World Culture Opens first cultural style Olympics in South Korea. Three hundred and fifty groups from the Creative arts, Holistic well being, and Humanitarian services from over seventy countries took part in the biggest Global Carnival Competition of all time. Descendance with only a small team of seven performers and Producer Jose Calarco, was able to overcome incredible odds and win the dance category in a field that boasted strong cultural teams from Ghana, Korea, China, Nepal, Nigeria, India, Russia, Egypt, Thailand, Greece, Sri Lanka and Japan, these highly organized teams were backed by their Governments while Descendance relied on the organisers UNESCO to get to the competition. The opening and closing ceremonies were extravagant; Seoul had not seen anything like this since it hosted the Olympics and the World Cup Soccer tournament. 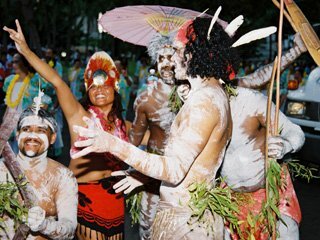 Australia led the processions, and it was a proud moment for the dance company and the indigenous people of Australia. Descendance appeared in the media frequently during the one week event, when Descendance was announced as the World Champions for the Dance/Peace category; the room erupted, as they proved very popular throughout the tournament with their unique culture, primal energy, and friendliness towards the other contestants. The Sixth International Drum Festival in Seoul provided the chance for Descendance to tour South Korea for the second time with in one month. Every autumn the city of Seoul heats up to the sounds of percussion and dancing, bringing out the inner passions of the people in this bright, modern and technologically advanced city, the festival dates back to 1999. Korea and most of Asia has had a long history of drumming in their culture, besides the human voice , percussion is the oldest instrument or form of expression known to mankind, therefore the beat of percussion has always awakened primal urges in the Asian culture whether the drums are used in ceremony or entertainment. 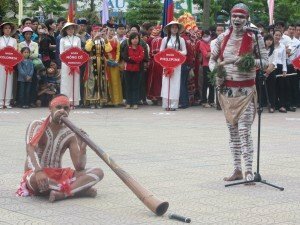 After Descendance’s recent World Culture Open Victory in Seoul in Sept, the company was invited back to Korea to perform for a second time at the cities major annual festival by the Seoul City Government. Teams from over twenty countries flew in for the event; these included some big names in the genre of percussion, such as Nexus, Handful, Los Khorus, Global Percussion Network, Jyou-Tian Drum, UNT African Ensemble, Primrose, and scores of Asian teams who without doubt produce some of the world’s finest percussion. 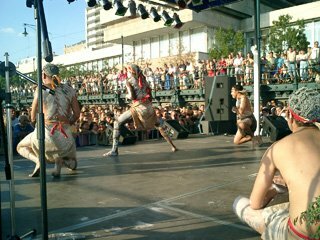 Descendance performed their traditional Aboriginal dance show in a rock style arena set up, complete with video screens, lazars, smoke machines, fireworks and extravagant lighting show, although not really a percussion group the Koreans considered the didgeridoo, clapsticks, chanting, and pounding feet as a rhythmic force worthy of entry into the festival. An audience in excess of 30,000 were enthralled with Descendance’s performance, as their style was so unique and in stark contrast to other artists, in such a colourful, spectacular festival dominated by dynamic drumming, costumes and theatrics. At the special dinner for the performers the Seoul City Government gave a special thank you to Descendance and presented them a crystal trophy for their contribution. Descendance was assisted by The Australia Council for this tour. Descendance completed eighteen performances at one of the worlds biggest travel expo’s: titled Destinations 2004; hosted by the London Daily Telegraph. 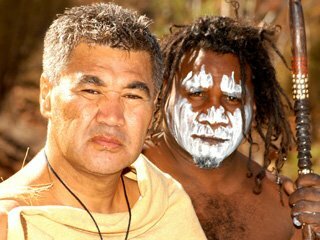 Descendance were promoting the “Boomerang Track” an amazing aboriginal experience holiday put together by Aboriginal Tourism Australia, and endorsed by Cathy Freeman. The size of the auditorium was enormous with representation from over one hundred countries. Descendance had the privilege to visit Buckingham Palace, Trafalgar Square, Camden and Piccadilly Circus; Descendance had performed in London before, at the Queen’s 2002 jubilee..
to inspect its opulent collection of treasures, the favourite being the Aboriginal painted cricket bat from the first touring side, with the story of cricket painted in Aboriginal totems. The British Museum still holds a shield of the very first Aboriginal person shot by Captain Cook’s crew with a bullet hole through it. After such an arduous journey to arrive in Budapest, the first thing one wants to do is sleep, not to change into traditional attire at the airport and perform a show in thirty five degree heat with the Media swarming everywhere, followed by interviews and other promotional appearances, this was day one of a month long tour through Hungary which was experiencing an abnormal heat wave, some sections of the media were sceptical about the tour claiming maybe the group was from India? 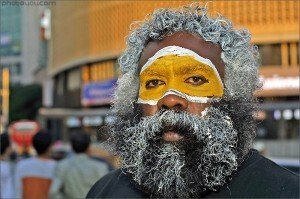 , after all Australian aboriginal people are now extinct? Once the first major performances kicked off, the troupe begun to enjoy the sound of rapturous applause, glowing reviews, and the media’s admiration, this tour would prove to be the making of Descendance, and begin a love affair with this beautiful and fascinating country, it opened the eyes of the performers and bought forward the realisation that the company must take its culture to the world. The schedule and travel around Hungary was relentless with at least two shows per day and one media engagement, with concerts in scenic picturesque towns like, Gardony, Balassa, Fehergyarmat, Debrecen, Tokoi, Rackeve, Bekes Gyenesdias, and of course the beautiful Lake Balaton (Europe’s biggest inland lake) , a special performance was hosted by the Australian Embassy in Budapest, Hungarian National day saw Descendance perform to 45,000 people on the Danube River, and on Hungarian National Day, 500,000 people lined the streets of Budapest, as Descendance took part in its celebration parade, at the final concert at the Budai Theatre, Descendance staged a ninety minute production, which also included fusions and contemporary works, sometimes the distance between performances would be over 300 kilometres. of the Hungarian people was unforgettable, an interesting thing worthy of a mention were the days the group spent with the old retired circus bears at their refuge just outside Budapest, the animals were mesmerised and loved listening to the sound of the didgeridoo for hours, the beasts were tamed. 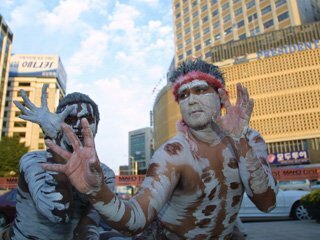 Descendance in association with Golden Travel Singapore, staged the first extensive exhibitions of indigenous dancing from Australia, promoting indigenous culture and products in Singapore, and looking to increase tourism to Australia. Singapore lying on the equator is certainly one of the hottest places in the world; the city is surrounded with modern skyscrapers and mega shopping complexes, with sprinklings of old Asia, and a little India section. Singapore was founded as a British trading colony in 1819. It joined the Malaysian Federation in 1963 but separated two years later and became independent. It subsequently became one of the world’s most prosperous countries with strong international trading links (its port is one of the worlds busiest in terms of tonnage handled) and with per capita GDP, equal to that of the leading nations of Western Europe. Australia finally made its debt at the EPCOT Centre in Disneyworld Florida in OCT 2003 at the annual food and wine fair which runs for six weeks each year. EPCOT is short for (experimental protocol community of tomorrow) a concept Walt Disney himself planned in 1966 (The year of his death) and was finally realized in 1982. Many countries from around the world are represented here with permanent set ups all year round, Descendance along with Southcorp Wines finally gave Australia presence in 2003, Disneyworld is the world’s number one holiday destination with 42 million visitors a year. The debut performance by Descendance was attended by approx fifty senior executives from Disney and Southcorp, Descendance was introduced by the President of Disney Epcot, Brad Rex, he said that recent research showed that Australia was the third most popular country at Epcot, and that he was so impressed with the Aboriginal dancing he bought his children to a performance, they were mesmerized he said and wanted to know will they be staying on all year? Each day 40,000 visitors were attending the Food and Wine fair, by the end of the six week season Australia had become the most popular stand, and Descendance won best show, while the Germans won best food.